Such is the money now found within football, it seems incomprehensible that Real Madrid’s Galácticos period will ever be replicated. Nowadays the presence of Manchester City, Paris Saint-Germain and other monied clubs means it is far harder for the European champions to snuffle up and hoard the world’s best. Almost two decades ago, Real had the likes of David Beckham, Luís Figo, Ronaldo, Roberto Carlos, and Zinedine Zidane all on their books. It is a quite amazing list of signings, although crucially, was missing one name. Florentino Pérez had passed him over for the more marketable Beckham, but, after signing for Barcelona, he would proceed to tip the scales of Spanish football back towards Catalonia. Admittedly there is more to the revival of Barcelona in the mid-2000s than the genius of Ronaldinho. Edgar Davids came in on a six-month loan to add steel and kickstart Frank Rijkaard’s spell in charge. The Dutchman then placed increased reliance on youngsters, with Andrés Iniesta and Lionel Messi central to the new look side he would leave for Pep Guardiola to take to new heights. Comparing Messi to Ronaldinho, in today’s terms, there can be no argument for who the greater player is. Defining the better of the two when at their peak, however, is something less easy to do. Call it childhood romanticism, but I genuinely believe Ronaldinho to be the more skilled of the pair. For justification, take a look at his performance in the second El Clásico of 2005. The build-up to this match had been no different to any other that surrounds Spain’s premier derby. The two juggernauts had begun the season in fine form – champions Barça in second and Real just a point behind. Both sides boasted a host of stars, with the aforementioned icons of Madrid joined by the likes of Carles Puyol, Deco and Samuel Eto’o in the Blaugrana. Ronaldinho foreshadowed how important he was going to be in this match early on, creating the first clear-cut chance. Collecting on the left-hand side, he opened up his body to make space, before picking out Eto’o with a beautifully weighted lofted pass. The Cameroonian was unable to profit, toe-poking his effort across goal after controlling well, but this was to prove a mere sighter. Eto’o made no mistake shortly after, profiting from a chance carved out by Messi. Mercilessly robbing the young Argentine of the ball, he turned 180 degrees before touching forward with his left and rifling home with his right. To do this amongst a ruck of four Real Madrid players, and then fire past one of the great goalkeepers of the modern era in Iker Casillas is applaudable, though the home fans don’t see it that way. In his celebration, Eto’o ran over to the director’s box, from where a grimacing Florentino Pérez is sat watching his empire be dismantled. Eto’o then pointed to the Barça badge on his shirt, just to reaffirm who he now plays for. Predictably, he received a torrent of abuse. Up until this point, the attempts of Eto’o to gain vengeance on those who formerly employed him, alongside the raw talent of Messi, had somewhat overshadowed Ronaldinho. In the second-half, however, the number 10 was a different animal. Around the hour mark, on the same left-hand side that he had occupied for most of the match, Ronaldinho received a pass from Deco. Advancing over the halfway line, he beat Sergio Ramos, leaving him on the floor as he gathered speed towards goal. A quick feint put off Iván Helguera and, with a yard opened up, the world’s best fired inside the near post of Casillas, who didn’t even move. They say the mark of quality is consistency and so it proved a handful of minutes later. Júlio Baptista was dispossessed by Xavi, who then found Deco. The Portuguese skipped round Pablo García in the centre circle and, again, fed the ravenous Ronaldinho. Once more he accelerated ferociously, breezing past Ramos and slotting low beneath a helpless Casillas. The Real ‘keeper shook his head in disbelief. Then came the moment of the match. In awe of the genius they were watching in front of them, large swathes of the Santiago Bernabéu stood up to applauded what they had just witnessed. A more cynical and, in truth, accurate elucidation of the sight would say that this was done mostly in sarcastic anger at the humiliating performance of their team, who took until the 75th minute to register a shot on target. Nevertheless, it is romantic to believe there was at least some degree of appreciation in the gesture. Such were the frequent complaints from Cristiano Ronaldo, no less, about the lack of support from the Madridistas, to see this happen for a Barcelona player is incomprehensible. Having only ever occurred before at the Bernabéu for Diego Maradona, it is a testament to just how incredible the Brazilian was. A fortnight later, he would deservedly be awarded his first and only Ballon d’Or. Arguably such a starring performance helped him secure the honour, although this was likely already a foregone conclusion. As if to prove this was no fluke, Ronaldinho then went on to retain his FIFA World Player of the Year award a couple of weeks later. Receiving both these awards, he dedicated them to his teammates. In terms of this team, Barça would end that season where they started it, namely as the best team in LaLiga. In the end, the Galácticos would finish 12 points behind, once again unable to keep up with the Catalans and their Brazilian genius. Barcelona would also be crowned champions of Europe, as Juliano Belletti proved the unlikely source of the winning goal late on against Arsenal. Ronaldinho would lift the famous trophy on that May night in Paris, with his status firmly secured as the best player on the planet. On that occasion, he didn’t directly contribute to either goal but it mattered not, for his performance the previous November had already etched him into football folklore. 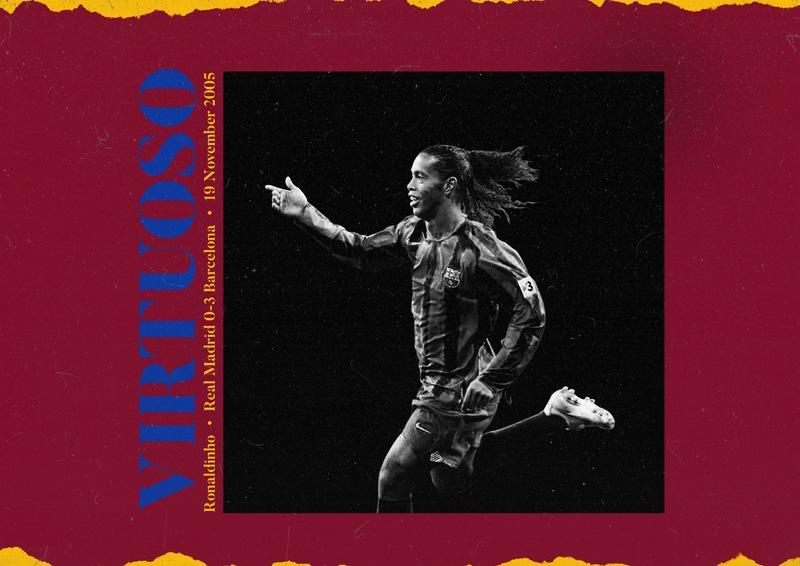 He may not have had the dedication or longevity of Messi or Ronaldo, but as the night of 19 November 2005 proved, Ronaldinho is more than worthy of being mentioned in the same sentence.